Whatsapp is a most famous messenger app for smartphones. It is highly demanded application by user several devices. It required internet connectivity and through whatsapp we can send and receive messages, audios, videos and images without any cost. Even can we share zip, doc and exe files on whatsapp. These are just few tips which can make whatsapp experience better. Even if you want to learn more about whatsapp then we recommend to read all whatsapp tricks and hacks. Today, here we will discuss about recovering deleted whatsapp messages. Whatsapp doesn’t use any online database for data storage. All the storage is done on user side in phone memory. But sometimes by mistake we delete our personal messages from our mobile phone chat by mistaken. We can’t recover deleted inbox messages. These kind of situations are really frustrating. But on the other hand if you are using Whatsapp, You can easily recover deleted whatsapp messages. But officially their is not any particular fixed method to recover whatsapp deleted chat. So today here we will discuss about the possible ways to recover deleted whatsapp messages. This will make your whatsapp life safer than ever. How To Recover Deleted Whatsapp Messages Recently. Recover Whatsapp Chat Older Than Seven Days. Method 1:- Recover Whatsapp Messages Through Software. Method 2:- Manually Recover Whatsapp Deleted Chat. Another Whatsapp Messages Recovery Online Tool. Recover Deleted Images, Audio and Videos (From Chat). Now, its simple to recover anything which is less than seven days old. You just have to uninstall whatsapp and re-install it. Because whatsapp automatically create backup file of whatsapp data everyday at 4 AM according to system time. This data backup file is stored on mobile SD card. So when you re-install whatsapp it will show Restore option. Simply click on it and all data which is less than seven days old will be restored. If you want to restore chat which is older than seven days then follow below given methods. There are two methods through which you can recover deleted whatsapp messages which is older than seven days. Note:- After connecting mobile phone with PC/Laptop via USB enable the USB Debugging option in the mobile phone. Simply Go Developer option >>> USB Debugging and enable it. 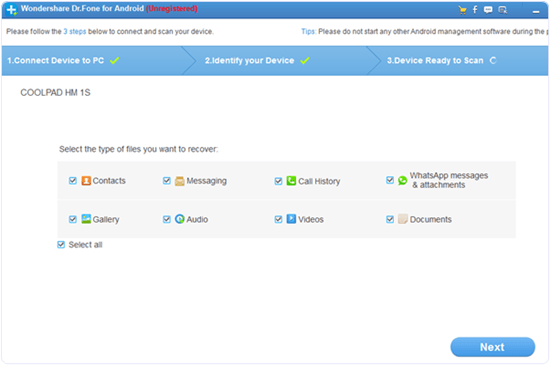 Step 1:- First download Android Data Recovery Software. It will restore your all whatsapp data like messages, images, audio and videos. 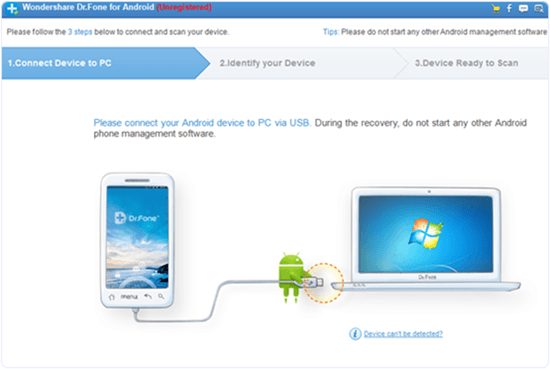 Step 2:- After installing Android Data Recovery connect your mobile phone with PC/Laptop via USB. 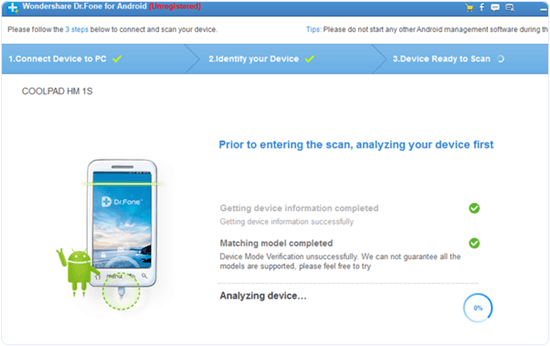 Step 3:- It will automatically detect your device and start processing. After that click on Next and select option what you want to recover. Step 4:- Now click Next. As we told above whatsapp create automatically backup file of your data and it stored in SD card. The route of stored data is:- sdcard/Whatsapp/Databases. When you find Database you will see different files which looks like “msgstore-YYYY-MM-DD.db.crypt”. The YY-MM-DD is on which year, date and month the file is create. So first you have to change the name of “msgstore.db.crypt” file rename it or add some other word/character before the “msgstore” like “Old” or etc. After rename the selected file uninstall your whatsapp and re-install it and select Restore option. It will restore your all chat which were deleted after the date of selected file. If you want to restore delete images, videos and audios from whatsapp chat. Then don’t worry because they are not permanently delete from whatsapp. Go to File Manager On Mobile. Click on Whatsapp folder >> Media. Then you will see whatsapp images, audio and videos folder. These are the folders where whatsapp images, audios and videos stored. You can also check this on your computer by connecting. Hence, these are few working method to recover deleted whatsapp messages online and offline both. You can use this guide in case of emergency to help yourself and others. For any help and assistance, feel free to write to us in comments below.